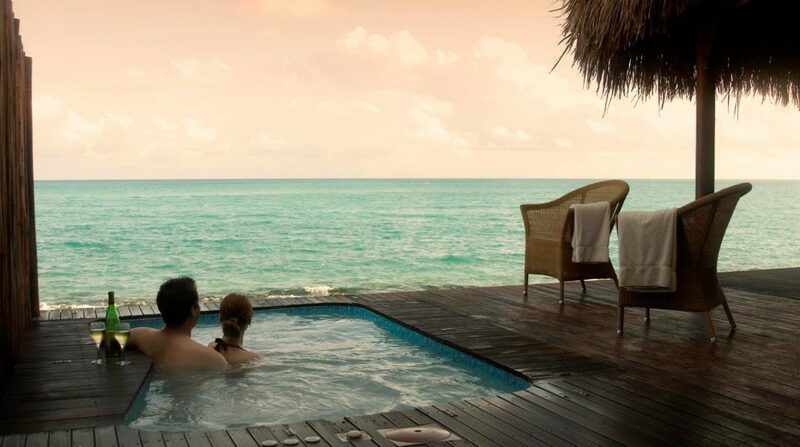 Enjoy royal treatment when you book your once in a lifetime honeymoon at Massinga Beach Lodge. Indulge in world class service, huge grilled lobsters, secluded beaches and magical private suite accommodation. Stay for longer during this romantic interlude – choose an Ocean View Villa with beautiful wooden furnishings, crisp white linen on comfy beds, rain showers and free standing baths. Sip sundowners together on your private deck and in your plunge pool. 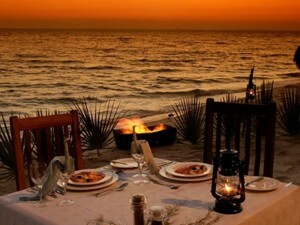 Honeymoon in paradise on your own private island just off the shores of Lake Malawi on the Mozambique side. Welcome to an untouched region and a luxury resort that features every mod con needed to enhance your holiday in Africa. Nkwichi Lodge was built by the local people using natural resources and promises guests a lovely earthy beach atmosphere. This romantic package includes boat transfers from Cobue, all meals, teas and coffees and non-motorised activities. Seek honeymoon bliss in the Quirimbas Islands at Anantara Medjumbe Private Island. We offer amazing special bride and groom discounts and the lodge provides romantic extras – a fruit platter and a bottle of wine in room on arrival, three-course romantic dinner for two and a snorkelling trip for two. Romantic walks on the beach, scuba diving and snorkelling or a dreamy sunset cruise on a traditional dhow. Experience an unforgettable 6-night Honeymoon special package on Vamizi Island in the northern Quirimbas region of Mozambique. Guaranteed beautiful secluded private island bliss in huge luxury villas on the beach. Chilled sparkling wine on arrival, candlelight beach dinner, champagne sunset dhow cruise, romantic isolated beach picnic, his & hers half hour massage and a private island nature tour just for the two of you. Romance counts at Vamizi Island. Named after the rare sea cow, Dugong Beach Lodge is a romantic beach and wilderness paradise off the Mozambique coast at Vilanculos. See not only Dugongs but also dolphins, Leatherback turtles and Manta rays. Enjoy your select honeymoon villa on the beach with ocean views and dine under the gazebo at night at the end of the boardwalk jetty. Couples look forward to a bottle of sparkling wine, romantic private dinner, sundowner dhow cruise and snorkelling trip for 2. Delightful Honeymoon package to visit Machangulo Beach Lodge in southern Mozambique. Stay 7 nights and enjoy a fabulous discount on the accommodation of the bride; an amazing honeymoon basket, a free dinner on their room’s patio or on the beach (Weather permitting), a romantic Dhow cruise to Santa Maria Village & a free romantic picnic on Inhaca Island including a free snorkel in the Marine Reserve. Speed boat access from Maputo. Grab the perfect opportunity for South Africans to enjoy a fantastic bush-beach holiday in South Africa and Mozambique. Enjoy a fully catered and guided safari experience in the lower Kruger National Park, complimented with 4 nights on the beach in a luxury ocean view lodge. From enormous African-style suites in the bush to romantic bathtubs with sea views. Eat roast venison in the boma at Kruger and fresh grilled lobster on the pool deck at Massinga. Enjoy exclusive wildlife encounters topped with a relaxed beach break on your once in a lifetime honeymoon. Witness South Africa’s Big 5 at the gracious and colonial-style Kirkman’s Camp where conservation today replaces the hunting of long ago. Stroll the manicured lawns bordering the wild bush and rest in opulent guest houses. Then catch a helicopter to Benguerra Island to view underwater marine wildlife and relax in lavish villas metres from the beach. Powder white beach and warm turquoise waters teeming with marine life ensure the perfect setting for romance at White Pearl Resorts in Southern Mozambique. Find this idyllic honeymoon destination in Ponta Mamoli on a private beach where you can horse ride together, swim with dolphins and simply relax with a beach picnic. Make magic memories with a pampering couples’ massage and candlelit dinners. Luxury suites with private plunge pools. Experience a week at Azura Quilalea, a fine eco-lodge in a protected marine sanctuary in the Quirimbas Archipelago where dolphins, whales, turtles and eels play. Mozambican hosts look after guests and the original rustic yet lavish lodge has been impeccably upgraded by locals. Enjoy makuti thatched roofs, wooden shutters, handcrafted huge beds and the finest linen. Snorkel from your deck. Perfect for special occasions with return helicopter transfers. Explore the beauty and old Africa charm of this fascinating country. Spending 3 nights at the romantic Victoria Falls will definitely get your honeymoon off on the right track. A total of 6 night’s game viewing in Hwange and Mana Pools National Parks will heighten your enchantment of the romance and beauty of the bush. The Royal Livingstone at the Victoria Falls in Zambia is perfect for the discerning honeymoon couple in search of luxury, extravagance and indulgence. This iconic hotel is spectacularly set in a lush riverine environment and maintains an air of sophistication often associated with a bygone era. The resort offers easy access to viewing platforms for the iconic Victoria Falls. Wish for this lovely African honeymoon to go on forever. Spend several romantic nights exploring the Serengeti and Ngorongoro Crater – highlights of Tanzania and a chance to see the Annual Migration. Then take time out from all the busy game viewing with 3 nights on a secluded and private tropical island at Mnemba Island Lodge. The perfect bush-beach combo tour for newlyweds – includes all meals, a hot air balloon safari over the Serengeti and a private beach picnic. Imagine spending your honeymoon sun bathing on sandy white beaches, splashing in azure waters and napping while a gentle breeze cools you down in the beautiful Mozambique Sun. Create such romantic memories when you book this week-long honeymoon package at the deluxe Azura Benguerra Lodge in the Bazaruto Archipelago. Your dreamy luxury villa features a handcrafted king size bed, outdoor shower, air-conditioning, daybed on your private deck and sala right on the beach. A romantic insight into Zambia and a chance to view its unparalleled and unspoilt beauty. Stay at four very romantic and private camps. Spend a total of 4 nights in South Luangwe at Nkweli and Nsefu Camp. Proceed to Chongwe River Camp in the lower Zambezi for 3 nights before finishing at Shumba Camp in Kafue National Park. The all-encompassing itinerary for safari enthusiasts. Book this romantic 10-day safari for an unforgettable honeymoon experience in Botswana’s prime game viewing parks. Splendid bush settings and personalized service in exclusive lodges – the perfect ingredients for romance in secluded bliss. Savuti Camp, Jacana Camp and Kalahari Plains Camp promise luxury amenities and splendid game drives in pure wilderness. Champagne for the couple, dreamy bush dinners and more. Honeymoon in vibrant Cape Town, rated one of the most popular destinations in the world, followed by 4 nights in the tranquil Okavango Delta. Hike Table Mountain, tan on Clifton Beach and sip wines in Stellenbosch. Cape Town has it all. Spread the love in Botswana for 4 nights in the most unique ecosystem in Africa. Enjoy Nxabega Okavango Tented Camp in a 25 000ha wildlife concession bordering Moremi Game Reserve. Mokoro rides, awesome wildlife, exclusive accommodation. Enjoy complete escape into nature when you visit Botswana’s prime wildlife areas on this 10-day safari. Spend long summery days witnessing the sheer beauty of the landscape where an astounding array of wildlife and birds co-exist. This intimate safari itinerary offers honeymoon couples the ultimate retreat – personalised welcome gifts at each camp, private bush and chalet dining, walking safaris, night drives and time to relax around sparkling swimming pools. Explore two UNESCO World Heritage Sites on this perfect elegant honeymoon tour, tailor made for intrepid couples. Hike up Table Mountain and take the cable car down; bungee jump off Victoria Falls then go white water rafting. In between, enjoy game drives in the luxurious Sabi Sands Game Reserve to view abundant wildlife. Opulent accommodation in world class hotels and lodges ensure your short vacation is unforgettable. The Etosha National Park is Namibia’s premiere game viewing experience, situated in the northwest of Namibia and is an area well known for its wildlife. Experience this beautiful region of Africa with this fly in package. Stay at the luxurious Ongava Tented Camp on a fully inclusive basis. A perfect wild life haven to indulge the senses and relax into the magic of bush therapy. Good food for the soul. Designed for the budget conscious traveller, this 8-night safari package introduces travellers to Victoria Falls, Chobe National Park and Moremi Game Reserve. Such iconic destinations make for an exciting trip: explore the World Heritage Site as it thunders over the falls and try some adrenalin activities. Game drives along the Chobe River and within the Khwai community concession reveal elephant herds like never before. Luxurious accommodation with excellent guiding and hosting. Located on the west coast of Mauritius in the Flic-en-Flac area, this luxurious and laid-back 5* property offers a romantic destination for honeymooners. With 3km of beachfront, you never feel crowded, and there’s plenty of room to enjoy your time as newlyweds. Experience the healing powers of the natural elements at the luxurious Spa which offers a private cabin for romantic couples’ massages. Included in your stay is a glass-bottom boat cruise and a unique dolphin trip. Enjoy barefoot luxury in paradise at Anantara Bazaruto Island Resort and Spa. Feel the romance in an elegant suite where world class service adds to the thrill of being on holiday in Mozambique. Enjoy a scheduled daily snorkelling trip to Neptune’s Nursery and long walks hand in hand on spotless beaches. Explore the Bazaruto Archipelago when you book a mind-boggling diving excursion and play tennis in the evenings. Taste fresh seafood daily and unwind properly. Cape Maclear is one of the premier Lake Malawi destinations, renowned for its sunsets and snorkelling. Pumulani is situated on the westside of the Nankumba Peninsula in the South end of Lake Malawi. The beauty of this lake is indescribable. The beautiful sparkling colours shimmering over the water, the clear blue skies and the panoramic vistas truly make you feel like you are in paradise. Spend 4 nights at Pumalani Lake Lodge on this fantastic fly in package. Combine your beach honeymoon with a cultural experience on Ibo Island. Visit local silversmiths and observe historical remnants and buildings that are centuries old. Idyllically remote Ibo Island Lodge promises a memorable experience far from the crowds. Savour delicious seafood dishes and enjoy phenomenal diving. Dhow cruises to a secret sand bank beach and fantastic kayaking into the mangroves. Your bride gets a fantastic discount. Experience the wonder of Victoria Falls and some secluded and private spots in Botswana together as newlyweds. This romantic and intimate African safari includes 2 nights in the grand Victoria Falls Hotel, remembering the opulence of colonial African charm. And 3 nights at Linyanti Ebony Camp, a private a secluded tented hotel in the north, followed by 2 nights at the quaint Khwai Tented Camp in a wildlife rich concession. Big 5, helicopter flip, romantic dinners. In Zambia you are bound to see a wealth of wildlife and birds thanks to their great conservation policies. Some 30% of the country is conserved for wildlife and the numbers of visitors into Zambia is restricted. Look forward to an exclusive safari in the environmentally rich regions of the Zambezi, Kafue and Luangwa rivers. Imagine overgrown ruins in a jungle island setting? Live like Tarzan and Jane in a castaway fantasy reminiscent of Robinson Crusoe. Reawaken your senses at Chole Mjine, a paradise offering 7 carefully placed thatched sea view treehouses, reached via sandy paths winding through natural vegetation. Children are welcome at Chole Mjini and will love the second level sleeping areas of the treehouses. Dine under the stars at candle-lit tables, within 19th century ruins or next to the murmuring ocean. Luxury and All Inclusive – you can’t ask for more. Ultimate relaxation and pampering while you’re on your honeymoon is the norm at Heritage Awali and it’s all included in the price. There’s a welcoming beach club on the picture perfect white sandy beach offering restaurants, a bar, and all the water sports you could want including waterskiing and kite surfing. Free green fees at the 18-hole Heritage Golf Club will allow all golfers to work on their game, and if that’s not for you, the Seven Sands Spa is on hand to offer alternative therapies. It’s the unexpected touches that make this resort special – from surprise pop-up cinema screenings on the beach to impromptu musical performances in the lush tropical gardens – feel pampered and rejuvenated by the end of your first day on the island. With world-class diving and snorkelling and the opportunity to view the resident whale sharks all-year round from the resort, its a diver’s paradise. Experience your dream honeymoon at the magical &Beyond Benguerra Lodge on Benguerra Island in Mozambique. As the romantic couple, you are welcomed with several surprises including private picnics for two, water sports galore and plenty of time to be alone in this tropical paradise. Book your honeymoon holiday package and spend long days on dreamy white beaches, snorkelling together over pristine coral reefs and lavish facilities including private plunge pools and mini bars.